Not sure if any one here reported on mammoth ~30,000 person survey (Bank America Merrill Lynch, 23MAY2018, 32 pp report). It surveyed smart phone users in four countries: mostly India, China, also US, UK. Here's first page, but lots of granular data, useful resource for AI, lots of good news for Apple: 30,000 responses imply iPhone dominance across markets We conducted a smartphone survey of approx. 30,000 respondents, across four key markets (US, UK, India, and China). In our view, the survey suggests Apple benefits from high customer loyalty as well as multiple avenues for growth in emerging markets, setting the company for sustainable growth for years to come. Our survey implies older generations of the iPhone, particularly the iPhone 6 and 7 are still widely in use across markets. With approx. half of respondents who are iPhone users intending on upgrading in 2018 and most intending on sticking with the iPhone, we see room for pent-up growth over the short term. We maintain our Buy rating on Apple. Material room for growth in emerging markets Our survey points to a significant opportunity for growth in both China and India. Across countries surveyed, those in India would most frequently upgrade their smartphones, with 48% of respondents noting to upgrade every year versus the overall avg. upgrade cycle of 2.03 years (although users are mostly for lower end phones). Also, 35% of respondents intend on upgrading in 2018 vs. 25% in China, 24% in the US, and 22% in the UK. In our view, Apple focusing on India with the rumored iPhone SE2 and local production with Wistron should solidify its growth prospects in the region over time. In China, services use remains the lowest out of the countries surveyed. In our view, as engagement in China grows to match the mature markets, it should further support global services revenue growth. A majority planning to upgrade in 2018, prefer Apple 8% of survey respondents currently own the iPhone X, vs. a combined 9% for the iPhone 8/8 Plus, 25% for the iPhone 7/7 Plus, and 23% for the iPhone 6/6 Plus. iPhone 6 use was especially high in China and India, emphasizing the opportunity for future upgrades. Across the US and the UK, the iPhone 7 showed the highest relative ownership. 29% of respondents intend to upgrade their smartphone in 2018, and a relative majority across all countries showed a preference for the iPhone. iPhone users stickiness is better than the competition According to our survey, approx. 72% of iPhone users intend to stick to Apple with their next upgrade, compared to 54% for Samsung, 55% for Huawei, 36% for Xiaomi, and 24% for LG. Still waiting for Apple's charger. Batteries are definitely a weak point in current iPhone designs. Any improvement would be welcome. Personally, I'd prefer more capacity at the expense of thickness. Fast charging is in itself a plus but should be a given on flagships. 9V/2A would align with the previous rumors that Apple would be including an 18W USB-C Charger with the next phone. The rather large company I work at has deals with the carriers where they have special pricing for the previous models of phone. Android is available for use but is a small percentage of phones used in the environment. It is mostly iPhone in use. BYOD is also used widely by many people who want their email on their personal phones and tablets. The iPhone 8 will not be available until after the "9"? is released. If other companies do that, it would drive sales of the 6s and 7 which might be what they were seeing in their survey. We don’t need faster charging. We need phones that need less charging. I use my iPad charger and my 8+ will go from 1% to nearly full charged in a hour or so. That works for me. We did. I'll find the link in a little while. Thanks for the heads-up, though! ... iPhone users stickiness is better than the competition According to our survey, approx. 72% of iPhone users intend to stick to Apple with their next upgrade, compared to 54% for Samsung, 55% for Huawei, 36% for Xiaomi, and 24% for LG. I would like to see how many intend to switch from iOS to Android and visa versa. If 54% will stay with Samsung, do they intend to move to iOS or stick with Android and get an LG for example. It seems obvious that the 28% of iPhone users intend to move to Android but what about the other way around? While questionnaire didn't ask that per se, there appear to be at least a few relevant responses. Page 16, chart 28: Which Brand of Smartphone Do You Think You Will Get Next? Apple was tops in all four countries, roughly 34% in China, 26% in India; 37% in UK; 40% in US. In China, 35% said "None, would NOT consider switching"; in India, 22%; in UK, 42%; in US 40%. To me, at least in hasty interpretation, that suggests the level of die hard Android fans. Encouraging that China and especially India appear less set than US and UK. 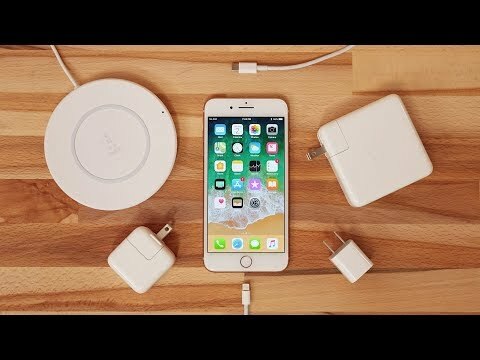 I just want the AirPower with the 7.5W, that’ll keep me happy! Hmm...did it reference their starting point? i.e. what they currently have when they gave that response? The Tech media likes to pit iOS against Android as a whole and not manufacturers in general. That’s the way it is where I work too. The phone guys are not allowed to order whatever the current generation iPhone is. We’re iPhone only for corporate devices but do allow Android BYOD. I do too. Unless you’re using a USB-C iPad charger though you’re charging at a max of 12W (5V/2.4A) so this would be a third faster. Seems IOS is slowly gaining in install base even when sales are flat, so moving from one to the other is not enough. IOS users keep their devices longer, so if they wait 4 years then move, vs 2 years then move, you got a constant rising number of IOS devices in activity at the high end of the market blocking anyone from gaining profit share by getting those users. Unless the IOS users are moving to S? from Samsung, they barely register for Apple since Apple doesn't compete in the lower 50% of the market. "Our proprietary smartphone survey of approx. 30,000 respondents conducted by Riwi, across four key markets (US, UK, India, and China) suggests Apple benefits from high customer loyalty as well as multiple avenues for growth in China and India, which in our view should set the company up for sustainable growth for years to come. Our survey implies older generations of the iPhone, particularly the iPhone 6 and 7 are still widely in use across markets. With approx. half of respondents who are iPhone users intending on upgrading in 2018 and most intending on sticking with the iPhone, we see room for pent-up growth over the short term." Apple’s phones rate at the top end of battery life among phones. It’s really pretty good. Always wanting more is normal, but really, the phones already have very good battery life. The reason why the Samsung Note 7 flared out was because they were trying to match, and possibly beat the new 7+ in battery life. Longer battery life isn’t easy. And no, most of us don’t to want to go backwards with larger and heavier phones to squeeze another hour of charge out. Faster recharging is fine. I was talking about the many other surveys, studies on IOS install base and not just this one specifically, they all say the same thing. Upgrade cycles increasing is something that plays into Apple's hands if people buy Apple the next time (which seems generally to be the case). If people keep their phone 4 years and then 20% switch, most phone sold each year would be from new Iphone buyers (at current sales volume)! Great for Apple.